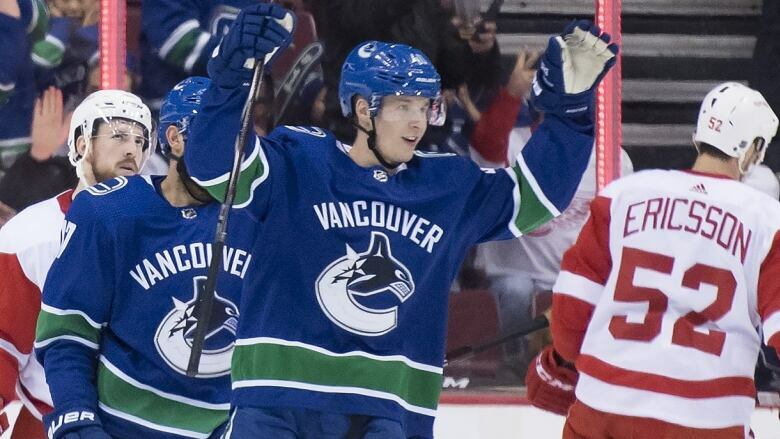 Elias Pettersson returned from a knee injury to lead his Vancouver Canucks to a 3-2 win over the Detroit Red Wings. "I felt I lost the puck a few times, made some bad decisions, some turnovers. But I've just got to play it simple," he said after Vancouver beat the Detroit Red Wings 3-2. "Whenever you miss [games with] an injury, and especially an injury that's with your lower-body, your leg your knee, it takes a couple games." Though Pettersson's first-period marker gave Vancouver an early lead Sunday, the team was forced to claw back from a 2-1 deficit after an ugly second period. "We were lucky they didn't score more in the second," the coach said, adding that during the intermission he didn't know whether to tell his players he was mad at them or feel sorry for how poorly they were playing. "I just said 'Hey, we've got a chance to win. If you haven't been good tonight, look in the mirror.' And give them credit — they did. They found their game. And when a team responds, you're proud of them." Vanek, a former Canuck, said it's frustrating for his team to give up another third-period lead. "It's tough, we're all pros, we want to win," he said. "It's no fun when you keep losing, but I think at least we are at the stage where we are playing consistently well. There's not bonus points for that unfortunately, but as a group we just have to put it behind us." The Wings dropped a 6-4 decision in Calgary on Friday, too, and the loses are tough on the team's confidence, said head coach Jeff Blashill. "That's the league right now," he said. "It's so tight that when you get on a roll you can really get on a roll. But that goes both ways, winning and losing, and right now we're on a roll the wrong way. We just keep finding ways to lose hockey games."